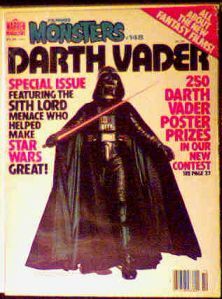 October 1978 issue of FM featuring a special on Darth Vader. Top right edge of front cover was cut a hair bigger than the page below it, so it has gotten a little rough where it overhangs. Otherwise this copy is near mint. One of the coolest things about FM were the ads in the back for Star Wars toys and other pop culture stuff. It's a great resource for collectors. Website design and hosting by Sohodojo Business Services. Item 125 of 466 items displayed in viewer. 0 items in cart.